China is the biggest but one of the most challenging gaming markets for Western developers to enter. China is the biggest gaming market on the planet, with 558.5 million players. In 2016, mobile alone accounted for 53% of total gaming revenues – reaching $14.6 billion in revenue, according to Newzoo. It’s also one of the most challenging markets for Western developers to enter. Internet services popular elsewhere in the world are non-existent in China. That means no Google, no Google Play Store, no YouTube, no Facebook, no Instagram, no Twitter and no Instagram. While there is the standard requirement to support the local language in games, in China, developers often need to go further. Since February 2016, game developers have needed to seek approval from China’s State Administration of Press before their games can launch. As part of this, developers must submit paperwork to authorities, obtain licenses, and work with domestic publishers if they want to bring games to mainland China. Basically, games need to be optimised and changed to ensure that in game content and storylines more localised than just the language. For example, characters may need to be redesigned and storylines may need altering to be in-line with Chinese culture. When launching in China, typically any western company will need to partner with a local Chinese publisher who will be responsible for the localisation, approval and promotion of the game. Currently, the only way for developers to get around this is to open a new office with quite a lot of investment in China – which is something only the biggest gaming companies do. Once you have a publisher, your game has been localised and approved, the hard work starts. 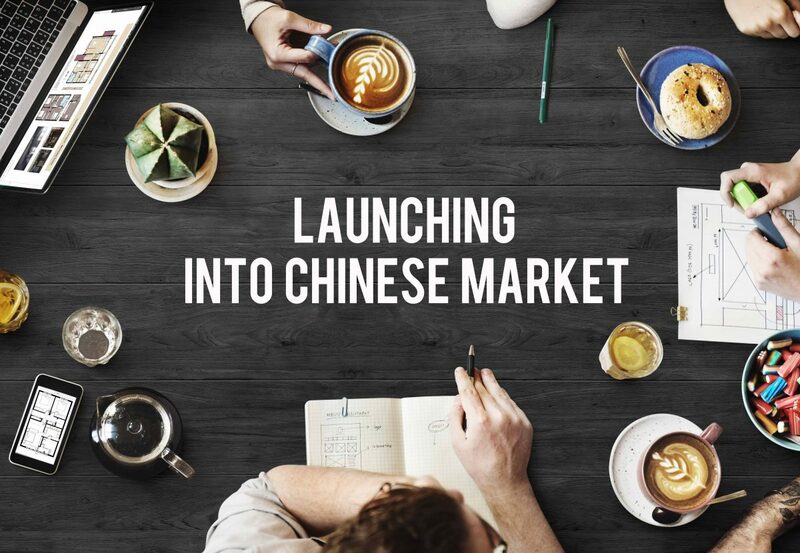 As with localising a game for China, the marketing and advertising playbook is also different. On the one hand, you have a lot of developers who chase the top of the charts through shady black hat practices. The black hat practices can make it harder for good games to break into the top of the charts, or to get much attention. In China, the most common form of Black Hat is known as Shuabang. Shuabang is the practise where you pay a company, that will hire and subcontract 150 to 200 part time, low paid workers, who will log on using the “shuabang” company’s millions of app store accounts. The workers will then be tasked with using a grid made of smartphones to download and review apps, until hitting targets. Shuabang leads to games that aren’t always very good getting into the top 10, which can be hard to contend with when you are running actual ad campaigns to attract high-quality users. 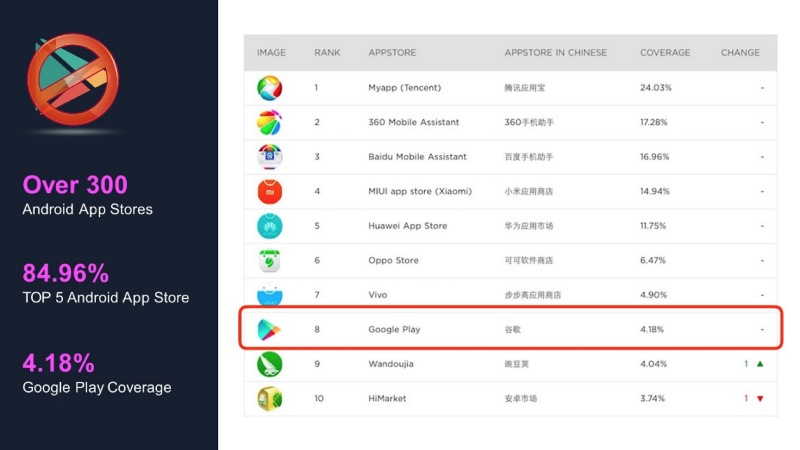 With no Google Play, other than VPN access, there are over 300 Android app stores in China. Tencent’s Myapp app store is currently the biggest in China, but that only reaches 24.03% of Android users in China. As the chart below shows, the top five Android app stores reach 84.96% of users. With iOS, there’s one App Store (unless you have a jailbroken iPhone). This means that you only need to direct an app ad to the App Store link, rather than using a system that detects which app store you are using and tries to send you to the right place. Launching on Android is a minefield, where you need to have different deals in place with different stores – and often have to enter into a revenue share agreement. While Facebook, Instagram and other social apps have proven to deliver good quality users outside of China, the lack of those companies in Mainland China means that you need to turn to the Tech Giants of China. Namely, Alibaba, Baidu and Tencent. Of the three giants, there is one that reigns supreme with mobile – Tencent. Over the past few years, Tencent has come to dominate the time spent on mobile. Across Tencent’s portfolio, it sees 830 million daily active users. Basically, Tencent is the first place many developers go when they want to launch games. A large part of the reason for choosing Tencent is WeChat. WeChat rules all. It is the platform used by 95.5% of mobile users in China and it does everything. Once you are in WeChat, you never really need to leave. Next is Baidu, China’s answer to Google. Baidu has 100 million daily active mobile users and is the way that people in China search – when they aren’t using WeChat. And then there’s China’s answer to Twitter, Weibo. With 90% of its 297 million daily users coming from mobile, it is largely a mobile first platform. Toutioo is China’s biggest news app, where its 78 million daily active users will spend an average of 76 minutes in the app. As the app also includes recommendations, it’s a highly effective app for advertising games and apps. It’s not just news apps though, utility and camera apps tend to deliver far better results than advertising games within other games. As some of the most popular apps in China, utility and camera apps tend to have millions of engaged high quality users. So, China may be the biggest gaming market on the planet – but it’s also one of the more complicated markets. If you run foul of rules by the Chinese government or upset Tencent, you’re going to be on a losing streak. Fortunately, the large majority of Western games that launch in China do so with a local publisher who handles the localisation and marketing. The real challenge for Western developers is finding a local partner who is able to handle all of that. If you manage to do that, you’ll likely see success thanks to China’s appetite for mobile gaming. Kabam, the US game developer, wanted to drive further awareness of Marvel Contest of Champions to increase in-game revenue. Having already amassed millions of users of the app since launch in China, Kabam wanted to increase purchase rates and encourage retention by driving users to play up to the end of level 5. Kabam also wanted to successfully launch Transformers: Forged to Fight in China and see high purchase rates from the game. A major part of the advertising strategy was not to target gamers as one would expect, but instead to target gamers inside some of China’s biggest utility apps such as Clean Master and Camera 360. By doing this Kabam increased purchase rates across both games by 116% from start to finish of its mobile ad campaign. Both games also saw more users reaching the end of level 5, thanks to understanding how to target users in China.